In our current global economic environment, the number of moving parts for the individual investor to track and attempt to analyze is often overwhelming. Without a systematic approach to the global asset markets, it is virtually impossible to discern the relative importance of an almost infinite number of inputs. While it is a tall order, we’ll attempt to highlight the some of the key moving parts of the economic engine in terms of the possible long-term impact on your portfolio and purchasing power. According to the Wall Street Journal, the net worth of individuals soared 82% from 1992 through 2000, and increased 39% from 2000 through 2008. How did this happen? Was it the “productivity miracle” fueled by technology? Since we all know productivity did not increase by 82% from 1992 through 2000, and again by 39% from 2000 through 2008, there had to be some other important factors. A prime candidate to explain the previously unheard of rapid increases in John Q. Public’s net worth is access to credit. By slicing and dicing debt into marketable and tradable (at least in theory) securities, Wall Street’s promise of reducing risk to lenders helped John Q. borrow his way to prosperity. During the last 15 years, John and his neighbors, the Jones family, borrowed money and bought consumer goods, stocks, bonds, and real estate. Sales increased and asset prices went up. John and the Jones family were happy because they felt better off when they looked at their brokerage statements and ever-increasing home equity. Feeling good from the “wealth effect” of their new found net worth, John, the Jones family, and the banks all thought even more credit was a good idea. It all worked well as long as asset prices continued to go up. It does not work so well when they don’t. With stocks not doing much since March of 2000 and real estate prices dropping like a lead balloon, it may be time to coin the term “reverse wealth effect.” Today, rather than feeling wealthy, the American public is saddled with debt loads which are heavier than ever. Since homes became ATM machines during the boom, John and the Jones family also have record low equity in their once piggybank homes. How does our government, which is also bursting at the seams with debt, attempt to stop the continuing erosion of the wealth effect? Right or wrong, they do everything in their power to attempt to stop asset prices (homes, stocks, etc.) from falling. As odd as it sounds, the policy makers “solution” to the problems caused by excessive debt and credit is to encourage more borrowing and more spending by lowering interest rates, sending checks to us in the mail, and moving ever closer to ownership in both our property and financial markets. When the Fed puts taxpayers’ money behind Bear Sterns and the Congress moves towards more and more loan guarantees, the American public is really being forced into indirect ownership of these assets. As the policy makers push more and more money into the economy to boost asset prices, the law of unintended consequences is raining on the bailout and money printing parade. Unfortunately for debt burdened citizen, the new money being pumped into the financial system is primarily flowing into commodities, not residential real estate or stocks. Why did Friday’s bad employment report help push oil prices even higher? A sagging economy also contributes to the deterioration of the wealth effect. The commodity markets feel policy makers’ response to the weak employment report will be to contemplate more fiscal stimuli while having an increased aversion to raising interest rates. After the technology bubble popped, easy monetary policies were able to maintain consumers’ feeling of wealth by fueling the residential real estate boom. The easy money experiment may be nearing its end as the current recipients of the newly created money (commodities) are now contributing to the reverse wealth effect. Are there fundamental forces behind oil’s recent move? Yes. In many of the world’s major oil fields it is becoming increasingly difficult and more expensive to get oil out of the ground. Much of the world’s low hanging fruit has already been snatched from the oil patch. According to the Wall Street Journal, OPEC’s spare capacity is “unusually thin – around 2 million barrels a day in a market of 86 million barrels a day – and much of that consists of a grade of heavy, sour oil that’s less attractive to the market because it yields fewer high-value products such as gasoline.” Additional supply issues facing the U.S. include more OPEC oil being sold to China, and declining U.S. imports from Mexico and Venezuela. Are there speculative forces behind oil’s recent move? 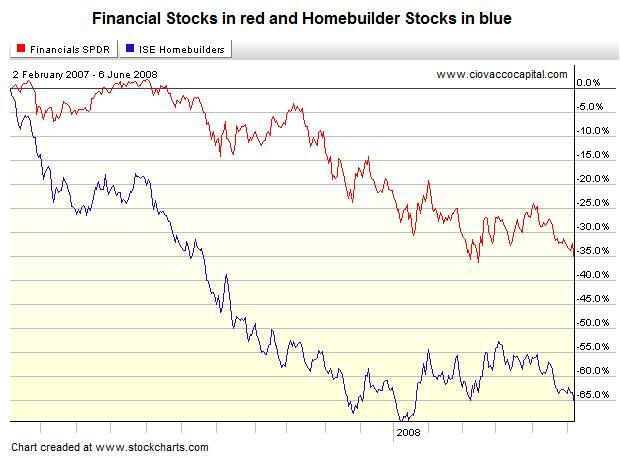 Yes, but there are speculative forces in every asset market. There are plenty of speculators trading on every major stock exchange in the world. 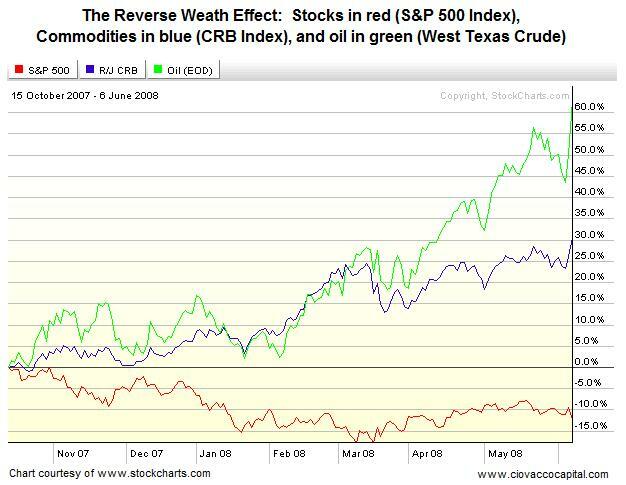 There is no question the investment demand for oil and all commodities has rapidly increased as prices have climbed. There are a couple of issues that make me question the significance of the role of speculation in the oil markets. First, one speculation argument says diversified commodity index-based investments are artificially driving up the price of oil. 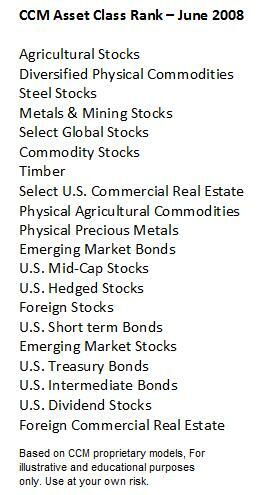 If this were such an important factor, would not all commodities in these indexes have also benefited from the increased demand? If so, would not all the commodities in these indexes have seen price spikes? Well, they have not. Second, these index investors never take physical delivery of the commodities. Instead the indexes keep rolling over contracts. If speculation was pushing prices significantly higher than what the fundamental market demands, wouldn’t stockpiles of oil be building up? They are not. In fact, oil stockpiles in the U.S. are well below the five-year average. Could oil have significant corrections even if it eventually moves higher? Yes. Commodities in general have historically experienced some wild swings even in the context of a long-term bull market. Are home prices showing any real signs of stabilizing? No. This is not good news for the consumer, economy, and banks. According to the Wall Street Journal, more than $200 billion of complex mortgage securities called collateralized debt obligations (CDOs) have hit “events of default,” which give some of their investors the right to force the vehicles to liquidate their holdings of mortgage-backed securities or swaps tied to them. The percentages of both subprime and prime mortgages that are seriously delinquent are at record highs. Delinquency rates and losses are also rising on construction loans, some commercial loans, and other forms of consumer debt, such as credit cards. This means access to mortgage credit will not significantly improve anytime soon. More foreclosures are coming which will only add more inventory to an already flooded market. Is there any good news on the credit front? Some. Banks have thus far been able to raise capital from individual investors, pension funds, and foreigners, who have helped them make some headway in terms of repairing their balance sheets. While far from normal, the conditions in the credit markets in general are better than they were in March. If I were running a financial institution, I would swallow my pride and quickly admit my mistakes and continue to raise capital as fast as possible. Why? Because at some point, the odds are good when the financial institutions go looking for new capital, the response from the markets will be less than cooperative. Those who attempt to raise capital late in the cycle, may find there is no more capital available. If and when this happens, the credit crisis will move to a second stage in terms of severity. The renewed weakness in financial stocks (see chart below), will make raising additional capital more difficult since recent equity investments have not been profitable. How does the value of the U.S. dollar come into play? When policy makers increase the supply of dollars (monetary inflation) in the financial system, the dollar becomes worth less in terms of purchasing power. It takes more dollars to buy the same amount of gas (price inflation is the result of monetary inflation). 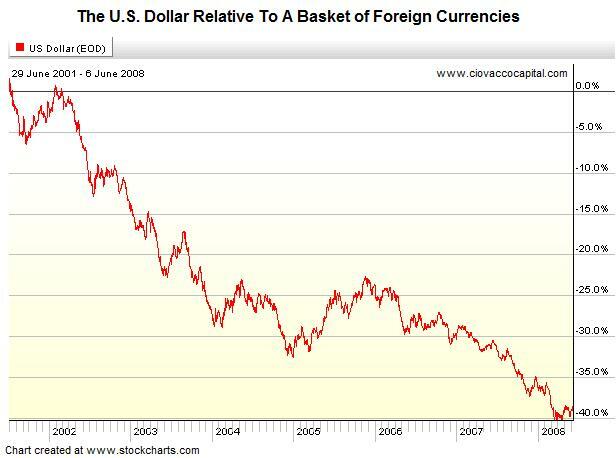 The dollar is being devalued via loose monetary and fiscal policy. Can’t the policy makers defend the dollar? Yes, but the best way to defend the dollar is to raise interest rates, which will in turn put more pressure on the U.S. housing market, consumer, and economy. As both the Fed and Treasury officials tried to do last week, releasing statements which express concern about the dollar and inflation are another way policy makers attempt to stem the dollar’s slide. Unfortunately, the Fed and Treasury officials may be losing credibility with the financial markets based on the lack of sustained reaction to their strong dollar talk last week. As shown in the table below, investments which provide some protection against price inflation continue to dominate the CCM Asset Class Rankings, a proprietary technical model which attempts to rank the relative attractiveness of investment opportunities. Physical commodities continue to give commodity stocks a run for the money. Timber, which is somewhat its own animal, has also shown some recent encouraging activity. Keep in mind, if timber prices are not attractive, the owners can continue to let the trees grow while waiting for more attractive prices. Broadly diversified and un-hedged global stock investments are less attractive than more selective hedged approaches which contain fewer positions and have exposure to fewer economic sectors. Precious metals remain attractive, but need to show some more strength in order to improve their outlook. U.S. bonds, not surprisingly, are less attractive than foreign bonds which can provide some protection against the ever-weakening U.S. dollar. U.S. policy makers’ fight to sustain the wealth effect coupled with the debt burdens of the federal government (budget deficits, Medicare, Social Security), strongly favor fiscal and monetary policies which will continue to increase (inflate) the number of U.S. dollars floating around the globe. Monetary inflation leads to price inflation. In an attempt to outrun the purchasing power drag of price inflation, investors are turning increasingly towards commodities and non-U.S. dollar denominated assets (foreign stocks and bonds). As a result, a traditional portfolio of U.S. stocks and U.S. bonds may offer disappointing real returns (after “price at the pump” inflation). In terms of recent history, 1970 through 1981 offers the best, all be it not perfect, comparison to what the future may hold for investment returns. A review of volatile stock, bond, and commodity prices from 1970 through 1981 is enough to get your heart racing. Our challenge as investors will be to build portfolios with acceptable levels of volatility that have exposure to inflation hedging assets.